The angels are spirits created by God. They have no body. They constantly are in the presence of God, praising him, but they also have been given to us by God as our special protectors, to keep us from both physical and spiritual harm. With these angel pendants, the wearer will have a constant reminder of these non-physical beings and how they can powerfully help us. 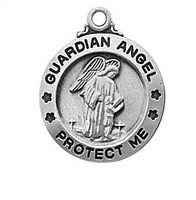 In particular, the guardian angel medallions will serve as a reminder to pray to your guardian angel whenever you need assistance. Sterling Silver Guardian Angel Pendant, Sterling Silver Lite Curb Chain, 5/8" x 1/2"
Gold Filled Guardian Angel Pendant, Gold Filled Lite Curb Chain, 1/2" x 1/4"
14 KT Gold Guardian Angel Medal, 1/2" x 1/4"
Sterling Silver Guardian Angel Pendant, Sterling Silver Lite Curb Chain, 1/2" x 1/4"
Gold Filled Guardian Angel Pendant, Stainless Gold Heavy Curb Chain, 7/8" x 3/4"
14 KT Gold Guardian Angel Medal, 7/8" x 3/4"
Sterling Silver Guardian Angel Pendant, Stainless Silver Heavy Curb Chain, 7/8" x 3/4"
Gold Filled Guardian Angel Pendant, Gold Filled Lite Curb Chain, 7/8" x 1/2"
14 KT Gold Guardian Angel Medal, 7/8" x 1/2"
Sterling Silver Guardian Angel Pendant, Sterling Silver Lite Curb Chain, 7/8" x 1/2"
Gold Filled Guardian Angel Pendant, Gold Filled Lite Curb Chain, 5/8" x 1/2"
14 KT Gold Guardian Angel Medal, 5/8" x 1/2"
Gold Filled Guardian Angel Pendant, Gold Filled Lite Curb Chain, 3/4" x 3/8"
14 KT Gold Guardian Angel Medal, 3/4" x 3/8"
Sterling Silver Guardian Angel Pendant, Sterling Silver Lite Curb Chain, 3/4" x 3/8"
Gold Filled Guardian Angel Pendant, Stainless Gold Heavy Curb Chain, 1" x 5/8"
14 KT Gold Guardian Angel Medal, 1" x 5/8"
Sterling Silver Guardian Angel Pendant, Stainless Silver Heavy Curb Chain, 1" x 5/8"
Gold Filled Angel Pendant, Gold Filled Lite Curb Chain, 3/8" x 3/8"
14 KT Gold Angel Medal, 3/8" x 3/8"
Sterling Silver Angel Pendant, Sterling Silver Lite Curb Chain, 3/8" x 3/8"
Gold Filled Angel Pendant, Gold Filled Lite Curb Chain, 3/4" x 3/4"
14 KT Gold Angel Medal, 3/4" x 3/4"
Sterling Silver Angel Pendant, Sterling Silver Lite Curb Chain, 3/4" x 3/4"
Gold Filled Guardian Angel Pendant, Gold Filled Lite Curb Chain, 1" x 7/8"
14 KT Gold Guardian Angel Medal, 1" x 7/8"
Sterling Silver Guardian Angel Pendant, Sterling Silver Lite Curb Chain, 1" x 7/8"
Gold Filled Guardian Angel Pendant, Gold Filled Lite Curb Chain, 3/8" x 1/4"
14 KT Gold Guardian Angel Medal, 3/8" x 1/4"
Sterling Silver Guardian Angel Pendant, Sterling Silver Lite Curb Chain, 3/8" x 1/4"
Gold Filled Guardian Angel Heart Pendant, Gold Filled Lite Curb Chain, 3/4" x 5/8"
14 KT Gold Guardian Angel Heart Medal, 3/4" x 5/8"